Wolfgang Muthspiel – whom The New Yorker has called “a shining light” among today’s jazz guitarists – made his ECM leader debut in 2014 with the trio disc Driftwood, featuring him alongside two longtime colleagues, bassist Larry Grenadier and drummer Brian Blade. 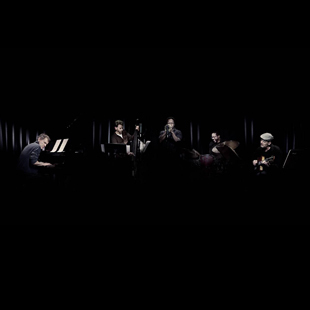 The Guardian extolled the album’s “ethereal, reflective and textural qualities,” while JazzTimes praised its “rapt atmospheres,” calling Driftwood “haunting.” For his poetic follow-up – Rising Grace – the Austrian guitarist has convened a very special quintet, adding jazz luminary Brad Mehldau on piano and a star among young trumpeters, Ambrose Akinmusire, to the subtly virtuosic Grenadier/Blade rhythm section. Each of the musicians on Rising Grace has a sound on his respective instrument that’s as identifiable as a fingerprint. “You only need to hear one chord of Brad’s to recognize the depth of his music, just the touch,” the guitarist says. “And Brian Blade is famous for his sound –from how he tunes his drum set, his floating way of playing, the way he makes the kit not a collection of separate drums and cymbals but this single warm, organic vessel.” The same distinctive soundprint applies to Muthspiel, of course, whether with the warm, sustaining lines of his electric guitar or, especially, the almost piano-like sound he gets from his acoustic. Driftwood was the first album to feature Muthspiel together with both Grenadier and Blade, although the guitarist had worked with each of them separately for many years. Muthspiel first played alongside Grenadier in Gary Burton’s band in the mid-’90s, with their subsequent work together including the trio Drumfree with saxophonist Andy Scherrer. Along with being a longtime member of the Brad Mehldau Trio, Grenadier has worked in the cooperative trio Fly (with saxophonist Mark Turner and drummer Jeff Ballard), which has made two albums for ECM. The bassist has also played on ECM albums by Charles Lloyd, Enrico Rava and Chris Potter. Blade has been a member of the Wayne Shorter Quartet since 2000 and leads his own Fellowship Band, along with having played with artists from Herbie Hancock to Bob Dylan. Muthspiel has known the drummer since the late ’90s, with the two eventually working in a trio with bassist Marc Johnson. Muthspiel and Blade have also toured and recorded together as a rare guitar-drums duo, Friendly Travelers.